Home > Used Vehicles > 2010 Volvo V70 3.2 WAGON,LEATHER,AIR,TILT,CRUISE,PW,PL, LOCAL TRADE, !!!! Cylinders: 3.2L I6 24V MPFI DOHC - 6 cyl. On sale now! This vehicle was originally listed at $12900. We've marked it down to $11900. You save $1000. This 2010 Volvo V70 is fresh on our lot in Edmonton. 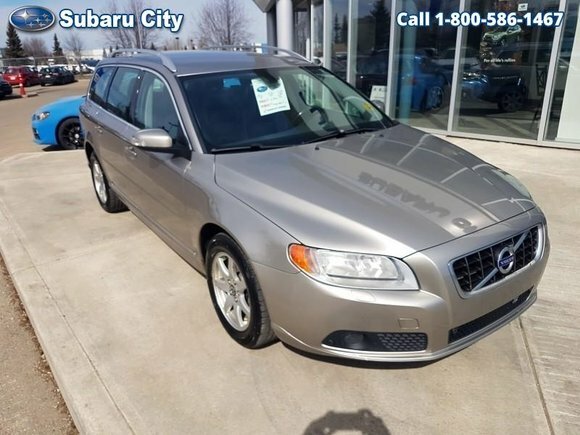 The V70 remains one of few large luxury wagons, and the one that's the most safety focused. Volvo claims that the V70's integrated child booster seat is a world first, and the features of the Personal Car Communicator, such as the heartbeat sensor, are unrivaled in the market. With a long standard-equipment list, the V70 represents a strong value in base form, or with one of its several options packages.This wagon has 156514 kms. It's silver metallic in colour. It has an automatic transmission and is powered by a 3.2L I6 24V MPFI DOHC engine. Buy this vehicle now for the lowest bi-weekly payment of $170.63 with $1333 down for 36 months @ 6.99% APR O.A.C. ( taxes included, $790 Administration and Secure Ride included / Total cost of borrowing $1317 ). See dealer for details. Want to try the 2010 Volvo V70 3.2 WAGON?